A couple of months ago I was collating a few US purchases. Among the purchases was the Inky Fingers’ Currently Inked log in the Traveler’s Notebook size. Inky Fingers is Matt Armstrong of the Pen Habit’s notebooks line. 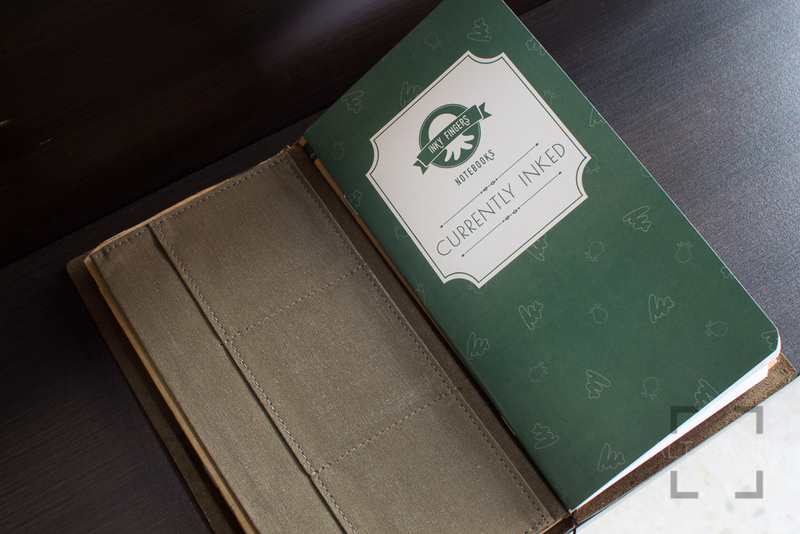 Inky Fingers offers notebooks in 2 sizes namely the Traveler’s Notebook size (roughly the height of a A5 notebook but minus 20% of the width, 110x210mm) and the pocket size 89x140mm. They come in blank, lined and ink log formats. The Traveler’s Notebook size costs USD$8 and the pocket size costs USD$5. I have been trying to maintain an ink log for the longest time. I find myself constantly switching notebooks. I fill maybe 10 pages or less before moving onto a new one. I am just leaving a trail of hardly used notebooks in my wake. With the Currently Inked Log I hope I will be more disciplined with my logging since it has a more structured approach to ink logging. 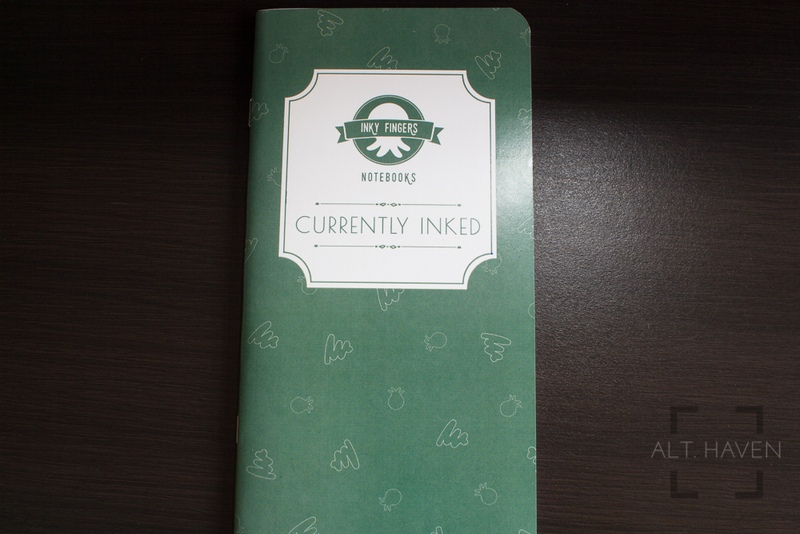 The Currently Inked Log comes with a glossy card stock exterior with a green background and artwork printed on it. It looked as if the resolution of the artwork wasn’t quite high-res enough because the printing looked slightly blurred when viewed up close but that’s totally nitpicking. Inside is ”44 pages of environmentally-friendly and sustainable wheat straw paper, which is made from the agricultural byproducts of wheat farming” (taken directly from the website) It is also advertised as more absorbent which results in shorter dry times without feathering or bleed through. I found the latter to be totally dependent on the ink used. I have had inks such as J.Herbin Emerald of Chivor, J. Herbin Vert Olive, Caran d’Ache Sunset and Levenger Amethyst bleed through in spots. It isn’t very bad bleed through just in some parts. In my previous efforts to keep an ink log I only write down the name of the ink and the pen used so I enjoy the structured approach that the Currently Inked log has. The page holds 4 entries per page and provide space for pen, nib, ink, date inked, date cleaned and a swatch. The date cleaned is one that I always neglected to fill in because I only fill it in when I ink up a new pen. By the time I return to the log again I might have already washed the pen. Numbering the pages is a nice touch. For the price that the Currently Inked Log is going for I think it is a good deal. I don’t ink up my pens often because I don’t write all that much day to day. Be that as it may, it is a usual log to have especially when I go to pen meet and people ask me what ink is in which pen. I look forward for my Currently Inked log to be filled up and this time I will be sticking to just that one notebook. No more semi used notebooks all over the space.